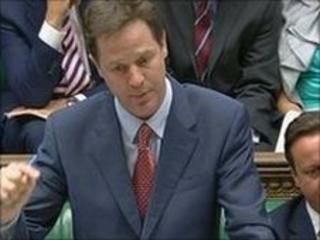 Deputy PM Nick Clegg's pledge to retain island seats in the UK parliament has been welcomed in Scotland. He plans to cut the number of MPs from 650 to 600 and review constituencies before the 2015 election. However, Orkney and Shetland and the Western Isles would be exempt because they were "uniquely placed given their locations", Mr Clegg told MPs. It had been feared that the island seats - which are small in terms of population - could disappear and that this would lead to their distinctive needs not being represented to the same extent in the UK Parliament. SNP MP for Na h-Eileanan Iar, Angus MacNeil MP, said the announcement was a "victory for common sense". "I have long argued that island constituencies are unique and cannot be parcelled up into neat population bundles in the same way as inner city seats," Mr MacNeil said. "The announcement by the UK Government today is welcome recognition of this." The leader of Comhairle nan Eilean Siar, Angus Campbell, said it was "good news for the Western Isles". He said: "I am pleased that the Government has recognised the case that the Comhairle has made. "If we had been tagged on to the west coast of Scotland the geography would have made it very difficult for an MP to properly represent constituents in such a spread out area. This is a common sense decision that will be warmly welcomed throughout the Western Isles."